In this area of the Apparel Search fashion brand directory, you will find men's fashion brands from leading apparel companies and fashion designers. On this particular page, you will find information regarding men's clothing with the Rawlings brand. 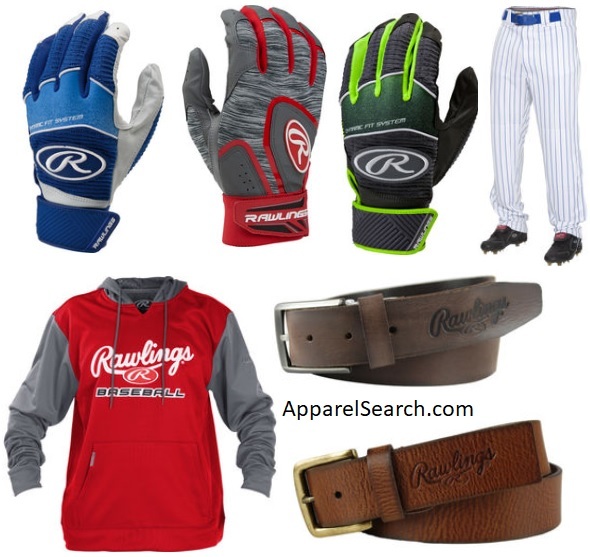 You are welcome to utilize this section of our clothing guide to review Rawlings news, Rawlings blog posts, Rawlings photos, and more. Please understand that you may run into a few photos or a tad of information that does not actually pertain to the men's Rawlings fashion brand. Unfortunately, no search technology is absolutely perfect. We will continue to do our best to bring you as much information about the men's Rawlings fashion collection as possible. If you are a fan of baseball, you are familiar with Rawlings. Manufactures and retails competitive sports equipment and apparel for baseball, basketball, hockey, softball, and football. Rawlings Sporting Goods Company, Inc. is a leading manufacturer and marketer of sporting goods in the United States. Since the company’s inception in 1887, Rawlings’ mission has always centered on enabling participation by developing and producing innovative, high-performance equipment and protective apparel for the professional, amateur and entry-level player. The parent company has been Newell Brands since 2016. With an assortment of baseball, basketball and football game-related product lines, Rawlings is present everywhere team sports are played. Learn more about men's Rawlings brand apparel. If you have changed your mind and do not wish to research the brand Rawlings, you can use the search engine on this page to find another clothing label that may be of more interest. Apparel Search is a leading guide to fashion, style, clothing, glam and all things relevant to apparel. We hope that you find this Rawlings page to be helpful.